Yate is the telephony engine aimed at creating a telephony server that performs well enough PBX requirements and flexible enough for complex VoIP gateway and IVR solutions. Yate VoIP is one of the very rare software got powered with working sip protocol that performs well on Ubuntu as well as any Linux distribution pretty well. Most of you may be not aware, Yate VoIP is written in C++ and it configured for many services such as IVR engine,Prepaid and/or postpaid cards system,H.323 gatekeeper,ISDN passive and active recorder,SS7 switch,Conference server – with up to 200 voice channels in a single conference and many more. Yate VoIP also supports scripting in various programming languages such as those supported by the currently implemented PHP, Python and Perl libraries. 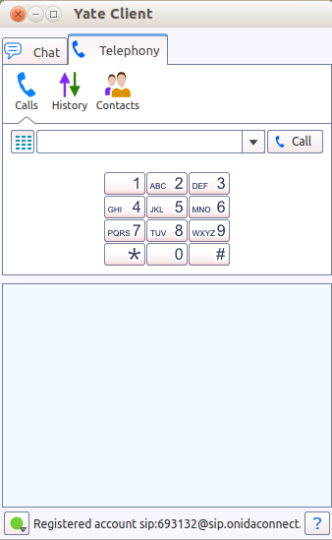 Yate VoIP can be used as an instant messenger as well as a soft-phone and supports telephony features such as call transferring,conference,history,address book. The advanced Yate VoIP is around 2.3 MB in size for Ubuntu and the developer worked hard to make it available to all platforms. Means,you can install it on any Linux, windows and Mac machines. It is pretty simple to configure compared to other VoIP clients and it also got support for Gmail and Facebook accounts. Download Yate VoIP for Ubuntu From here.